Tourism is one of the world’s largest industries, contributing trillions of dollars to the global economy and supporting the livelihoods of an estimated one in ten people worldwide. Much of that tourism depends on the natural world—on beautiful landscapes and seascapes that visitors flock to in search of escape, a second wind, and a direct connection with nature itself. That nature is the foundation for much of the world’s tourism is clear—travelers are willing to pay a premium for a room with a view, and words like “pristine,” “remote,” and “unspoiled” are frequently assigned to amenities like beaches, coral reefs, and panoramic seascapes. The dependency of the travel and tourism industry on a healthy environment goes much deeper than that, however. Not only does a reef provide entertainment value for seaside visitors, but it can deflect waves that cause erosion and reduce the risk of storm surges that can harm the industry’s bottom line. Furthermore, mangroves and seagrass meadows are excellent at absorbing and storing carbon, reducing harmful emissions that cause climate change. And all of those coastal ecosystems produce fish that are a favourite on restaurant menus, providing additional economic opportunity for coastal communities. 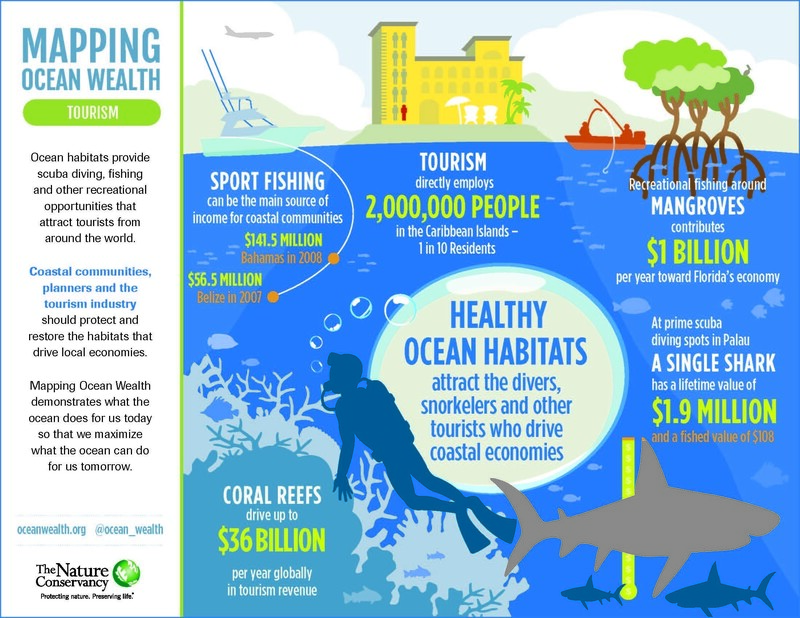 The Nature Conservancy’s Mapping Ocean Wealth (MOW) initiative provides exactly this information. A new MOW study published in the Journal of Marine Policy reveals that 70 million trips are supported by the world’s coral reefs each year, making these reefs a powerful engine for tourism. In total, coral reefs represent an astonishing $36 billion a year in economic value to the world. Of that $36 billion, $19 billion represents actual “on-reef” tourism like diving, snorkeling, glass-bottom boating and wildlife watching on reefs themselves. The other $16 billion comes from “reef-adjacent” tourism, which encompasses everything from enjoying beautiful views and beaches, to local seafood, paddle-boarding and other activities that are afforded by the sheltering effect of adjacent reefs. The impact of this new information is already being recognized, as Mapping Ocean Wealth received the 2017 Tourism for Tomorrow Innovation Award from the World Travel and Tourism Council. In fact, there are more than 70 countries and territories across the world that have million dollar reefs—reefs that generate more than one million dollars per square kilometer. These reefs support businesses and people in the Florida Keys, Bahamas, Mexico, Indonesia, Australia, and Mauritius, to name a few. The Conservancy’s Atlas of Ocean Wealth , and accompanying interactive mapping tool , serves as a valuable resource for managers and decision makers to drill down to determine not just the location of coral reefs or other important natural assets, but how much they’re worth, in terms of their economic value as well as fish production, carbon storage and coastal protection values. By revealing where benefits are produced and at what level, the MOW maps and tools can help businesses fully understand and make new investments in protecting the natural systems that underpin their businesses.